Visiting the Everglades has been on my, "places to visit list" for a very long time. 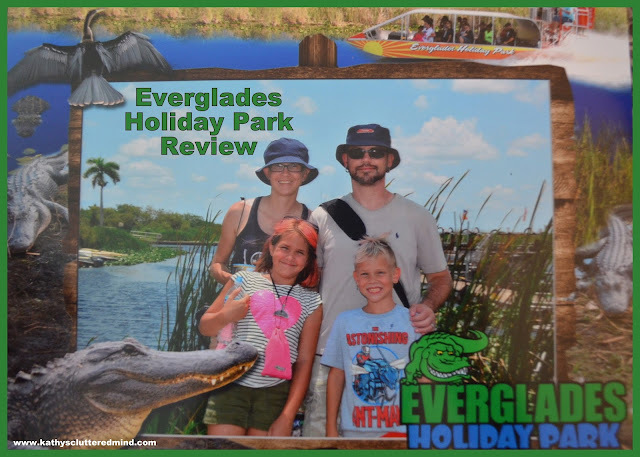 So when we received an opportunity to review Everglades Holiday Park during our visit to Florida I just had to say yes. Everglades Holiday Park is located in Fort Lauderdale, Florida so it took us about 3 1/2 hours to get there from the Orlando area but the drive was well worth it. We arrived at the park around 11 am. Parking was plentiful and it was very easy to locate the gift shop where we received our airboat tour ticket. The gift shop was quite large and offered snacks, souvenirs and fishing gear. There were well maintained restrooms located just outside of the gift shop. There was also a deli located next to the gift shop in case you need to grab a bite to eat. After receiving our airboat tour tickets we went outside to sit on the covered porch in front of the gift shop to wait for our tour number to be called. In about 10 minutes they announced our tour number over the PA system and we proceeded down to the boat dock. Once at the boat dock a staff member gathered our family and took a souvenir photo. And guess what the photo is included in the cost of your tickets! How cool is that? No need to pay another $20+ for a photo to remember your experience. At this point the kids were getting really excited.....okay so was I. Our Captain walked us up the dock to the boat and we piled in. The boats seat 20+ people and are covered so you don't have to worry about melting in the Florida sun! After our Captain Mike went over some rules we were off on our 60 minute thrilling airboat tour of the Everglades. WOW! We learned so much in 60 minutes. Mike told us the history of the area, how the Native Americans lived off the land, and how to survive if you ever get lost in the Everglades (which I hope never happens...eek). He also showed us the numerous flora and fauna of the area and yes we did get to see a couple alligators...one of them was only a few feet away from the boat! Our Captain really made our experience a fun and remarkable one. It is one that we will never forget. He was funny, informative and you could tell he was very dedicated to his job. **Important note: bring cash to tip your airboat Captain and the Gator Boys that do the presentation...they deserve it. The Everglades Holiday Park airboat experience is perfect for all ages and a must for nature enthusiasts, thrill seekers and artists! This video clip explains it all! After our airboat tour we picked up our souvenir photo and headed up to the waiting area for our gator show with the famous "Gator Boys"! If you don't know who the Gator Boys are let me tell you a little bit about them. The Gator Boys are a group of people (and not just boys there is a woman too) dedicated to rescuing nuisance alligators around Florida. Their reality show airs on Animal Planet, in fact many of their episodes were filmed at Everglades Holiday Park. When it was time for our show they walked us down to a covered walkway located in front of the "gator pit." **Important note: Everglades Holiday Park is in the process of building an arena area for future shows! The 20 minute show is an adrenalin-charged good time filled with exciting stunts, tricks and some of the best entertainment around. It is also very educational which is a plus for our homeschooling family! The show is very animal friendly and in fact the Gator Boys Alligator Rescue actually helps nuisance alligators by giving them a place to live and eat in a natural setting. These gators, if not rescued would have been euthanized...instead they are now animal ambassadors helping to break down alligator stereotypes! After the show is over you can head over to the photo area to capture some more special memories. For a small fee you can get a memorable experience and photo holding a baby alligator, snake or other critter (animals do vary but they generally always have a baby alligator available for a photo shoot). Look at their grins. They were in absolute heaven. We give Everglades Holiday Park 5 stars. The cost, experiences and staff were all stellar. 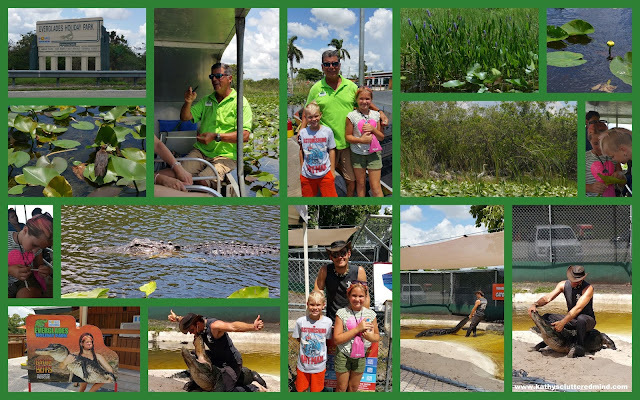 We highly recommend this experience to any family looking for a one of a kind way to spend their time in Florida! I promise you will not be disappointed. When I posted our photos to social media several followers told me they had similar experiences with Everglades Holiday Park and visit every year when they vacation in Florida! Ask QUESTIONS! The captains are a wealth of knowledge and being prepared with questions can definitely enhance the experience. Take along sunscreen and bus spray...after all it is Florida and a swamp! Don't forget to take cash along to tip your airboat Captain and the Gator Boy or Girl doing your show! All ages can ride the airboat, children under 3 are free! Find out about various family friendly events taking place at the park by visiting the Gator Kids Club page. 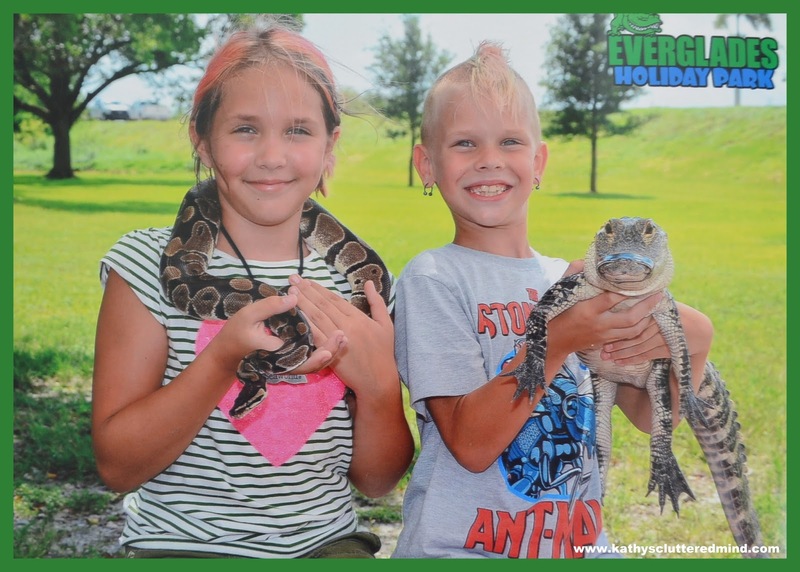 Everglades Holiday Park is home to many animal species learn more about them here. If you want to get a glimpse of the park before visiting check out the web cam. Everglades Holiday Park can accommodate various groups and offers discounts for 15 or more, read more here. *We received free admission in return for an honest, unbiased review. All opinions are our own.